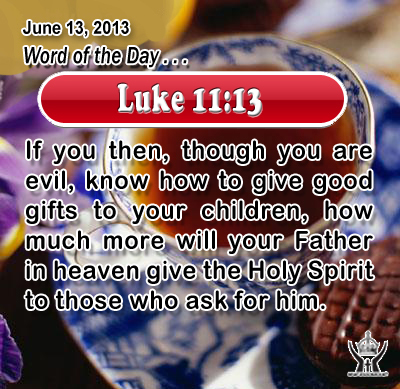 Luke 11:13If you then, though you are evil, know how to give good gifts to your children, how much more will your Father in heaven give the Holy Spirit to those who ask for him. Abba Father, through the Holy Spirit we come before you asking you to make powerful us, our loved ones, and our community through the power of your Holy Spirit. We pray for renewal to sweep over our country and our world led by your Spirit of grace, power, and love. In the name of Infant Jesus, the giver of this great gift we pray. Amen. 20For I tell you, unless your righteousness exceeds that of the scribes and Pharisees, you will never enter the kingdom of heaven. 21 "You have heard that it was said to the men of old, `You shall not kill; and whoever kills shall be liable to judgment.' 22 But I say to you that every one who is angry with his brother shall be liable to judgment; whoever insults his brother shall be liable to the council, and whoever says, `You fool!' shall be liable to the hell of fire. 23 So if you are offering your gift at the altar, and there remember that your brother has something against you, 24 leave your gift there before the altar and go; first be reconciled to your brother, and then come and offer your gift. 25 Make friends quickly with your accuser, while you are going with him to court, lest your accuser hand you over to the judge, and the judge to the guard, and you be put in prison; 26 truly, I say to you, you will never get out till you have paid the last penny. Mercy, kindness, and forbearance spring from a heart full of love and forgiveness are the antidote to anger and rage. God has forgiven us and he calls us to expand mercy and forgiveness towards those who cause us sorrow and harm. In the cross of Jesus we see the supreme instance of love and forgiveness and the power of kindness for overcoming evil. Only God’s love and grace can set our hearts and minds free from the oppression of wounded pride and malicious revenge. Do we harbor any anger towards another person? And are we quick to be reconciled when a break has been caused in your relationships? Ask God to set us free and to fill your heart and mind with his love and goodness. Paul the Apostle reminds us that "God's love has been poured into our hearts through the Holy Spirit which has been given to us". Through the grace and help of the Holy Spirit we can conquer malice with good, hatred with kindness, and wound with pardon.